During my son’s Christmas Break this year, his first ever from school, I took Pops and Max to a little ditty of mine. We actually hooked fish too. While dad worked with Max and his sweet little one-piece, graphite spin caster…I went and threw some BC Steels around. 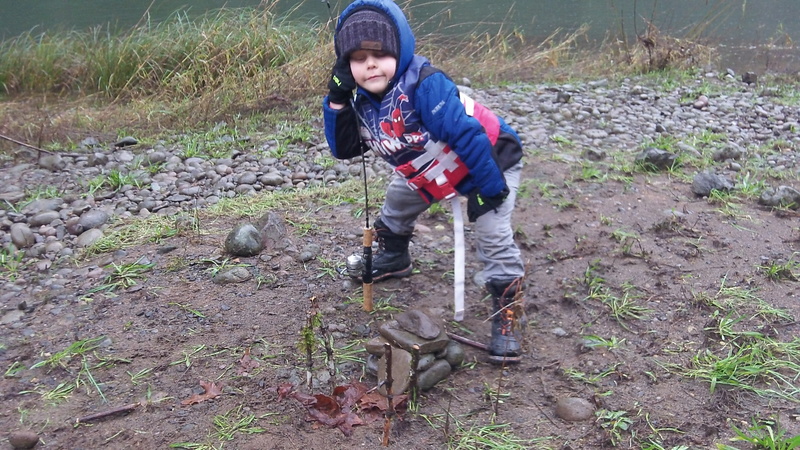 If you read All Around Angler then you should know what my favorite one is for the rivers here in OR and WA. Anyone hazard a guess? Weight and color….over. Back to the story….Before we took off for the day I had rigged Max’s rod up with an 1/16th oz steelhead jig with the hooked chopped off. This rig kept him busy without danger or snag. I call it the baby-sitting fishing rod. Once I scoped down river I saw the change in bottom contour. It was deeper closer to the bank. Which meant I could twitch and flutter my spoon as well as cast and retrieve. The weather had taken a turn and my little guy was getting pretty chilly. With limited time due to an ‘over the boot with water’ scenario for Max, I successfully hooked three fish with this method. Two of which I tried to walk up river to Maxwell and my dad who were without waders. 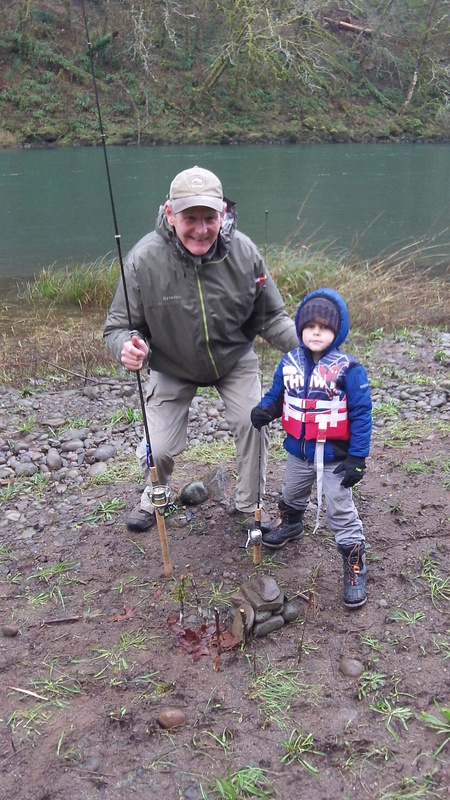 One of the fish, which were both coho or summer steelhead, I successfully handed off my big rod to my son…ever so briefly before the lack of tension on the siwash freed up the fish. 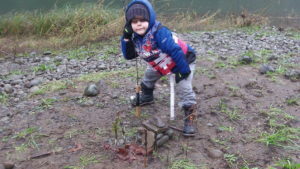 Max was doing great casting the Zebco. Luckily he never figured out the effect of not having a hook on his jig and his chances of hooking a fish. He was excited and we do need to get him hooked up on a fish. It was a fun day. Three generations of Hellcats on the river!! That had to be great day for you Chris!! Hopefully this reminds you how lucky you really are!! Won’t be long before you can put a hook at the end of Max’s rod!